Strip Steaks from BN Ranch for sale. Buy online at Zingerman's Mail Order. Gourmet Gifts. Food Gifts. Exceptional steaks from America's premier source for sustainably, humanely raised meats. In the food world, Bill Niman’s name has long been synonymous with sustainably-raised pork and beef. While he left his namesake Niman Ranch operations some years ago, these days with his company BN Ranch he's raising some of the most flavorful grass-fed and grass-finished beef I’ve ever tasted. Sometimes grass-fed beef can be hit or miss if there isn’t enough fat development. That can happen because grass, like any other plant, has a season. When cattle are fed a diet of corn and other grains, that seasonality is erased and the beef is pretty similar all year. But when the cattle are out on pasture eating grass, in the summer and fall there's more variety in the vegetation and the grasses grow like, well, weeds. The cattle eating those rich grasses get pleasantly plump. It's the same story as we see with cheeses that are more complex and flavorful when they're made with summer milk. To ensure that the beef is always at its peak, Bill only brings his cattle to market when the grasses—and therefore the cattle—are in season. The seasonality is only one of the details that Bill and his team pay attention to. The cattle are raised impecably. They spend their entire lives out on pasture, grazing every day. They are never given any hormones, and they only get antibiotics if they're sick and need them to get better. All the little steps add up. These New York Strip steaks are some of the best I've ever tasted. They have incredible marbling, and that fat means huge flavor—the best way I can put it is that taste steak-ier than most. I like them grilled to medium rare, seasoned with just a sprinkle of good sea salt and freshly cracked pepper—they don't need anything else. However you cook them up, they're sure to be the new standard to which you hold all grass-fed beef. Steaks ship frozen, though they may thaw and be cold, not hard, when they arrive. They come two to a pack, and include the bone. "Tonight I cooked the NY Strips. Took them out of the fridge 2 hour before cooking them to get them to room temp. I got my grill to 550F and cooked mine 9 minutes (4:30 each side), my wife's 12 minutes (6 minutes each side). I let them rest for 5/10 minutes and then put some salt and extra virgin olive oil. I wished I cooked mine even less that that. It was pink inside, I was trying for a rare. 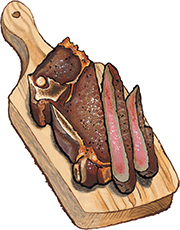 But they still had AMAZING flavor, and the fat was flavorful and crunchy (meat candy)."